One Air National Guard spouse has just gone beyond the ‘No Pain, No Gain’ weightlifting slogan. And this isn’t Olympic weightlifting or body building — this is powerlifting. “My wife is currently the number three rated woman powerlifter for her weight class in the nation,” said Senior Master Sgt. Andrew Traugot, director of education at the I.G. Brown Training and Education Center, Tenn. in an Air Force press release. In her personal best powerlift competition, Vikki Traugot benched 325 lbs., deadlifted 408 pounds and squatted 480 pounds. In her most recent professional meet, she took first place overall in the women’s 148-pound weight class and walked away with $1,500. Powerlifting focuses on strength with three main lifts: the squat, the bench press and the deadlift. Lifters get three chances during competition to lift their maximum weight. Vikki is former Army National Guard, and married Senior Master Sgt. Traugot 30 years ago after meeting and studying Chinese at a military school. Vikki, 50, crossed from the Army Guard after two years to join the Army for four more years before leaving the service. She started powerlifting during her husband’s first assignment at McGhee Tyson Air National Guard Base, Tenn. as an Air Guard professional military education instructor. After eight years of lifting, she continues to lift four times a week at a gym that has special equipment and experienced powerlifters to spot and coach her. 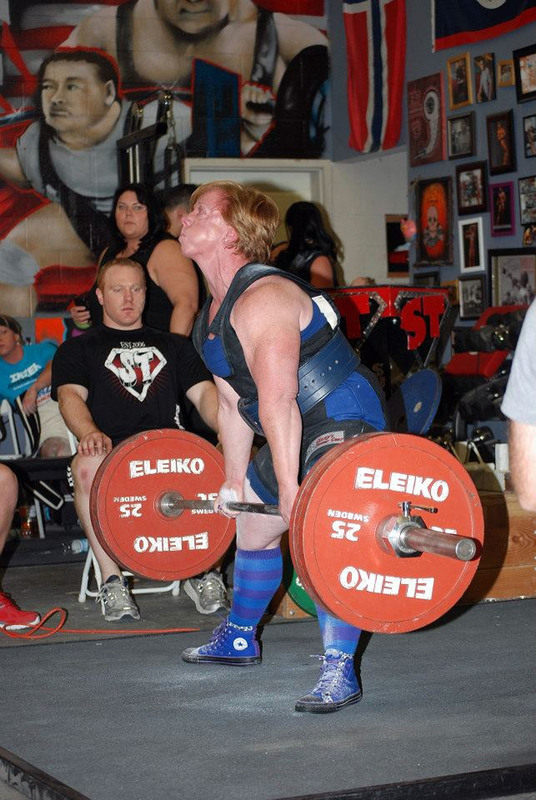 She lifts in the Southern Powerlifting Federation as well as for the U.S. Powerlifting Association. She said she hopes to beat her personal best at the U.S. Powerlifting Association Olympia Invitational in Las Vegas this fall. She will participate in other competitions until then to maintain her progress.